Heat oven to 425°F. Lightly brush large cookie sheet with 1 tablespoon of the oil; sprinkle with cornmeal. In 8-inch skillet, cook pancetta over medium-high heat, stirring occasionally, until crisp; drain. In large bowl, mix lettuce, chicken, mozzarella cheese, plum tomatoes, sun-dried tomatoes, sliced basil and pancetta; set aside. Unroll pizza crust dough; cut into 4 rectangles, using pizza cutter. Place rectangles on cookie sheet. Press each rectangle into 8x6-inch oval, folding over edges of dough to form a rim. Brush remaining 1 tablespoon oil over dough ovals; sprinkle evenly with Italian seasoning and Asiago cheese. Bake 11 to 13 minutes or until crusts are golden brown and cheese is melted. Pour dressing over salad mixture; toss to mix. 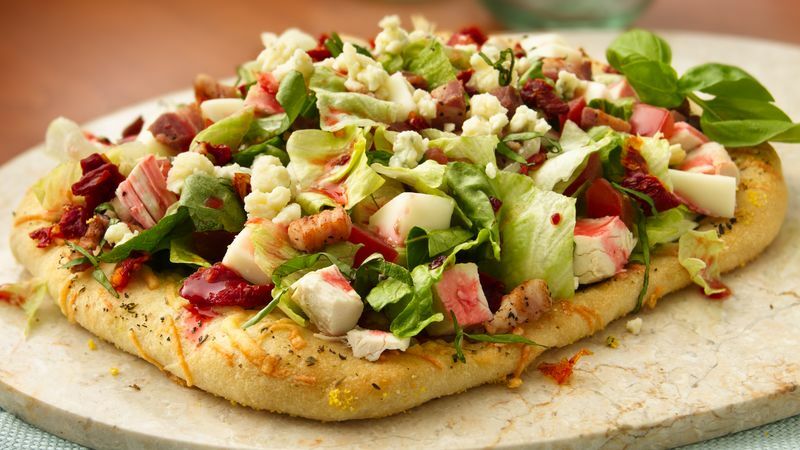 Mound about 2 cups of the salad mixture onto each pizza crust; sprinkle with Gorgonzola cheese. Garnish with basil sprigs.